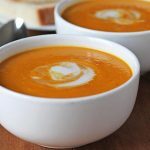 A vegan slow cooker curried cauliflower sweet potato soup that is easy to make and is the perfect lunch or supper for chilly fall and winter days. Add in the coconut milk, 1 tsp of curry, and the cumin. Blend again making sure that all spices are incorporated. If you'd like, add more curry to taste. If using coconut milk for garnish, drop a tablespoon of coconut milk in the center of each bowl of soup. Nutrition info is based on 1 of 6 servings and is only to be used as a rough guide. Click to learn how nutrition info is calculated on this website.